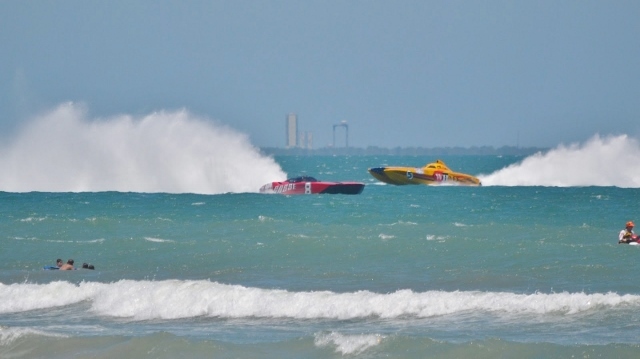 COCOA BEACH and PORT CANAVERAL, Florida -- The 7th annual "Thunder on Cocoa Beach" super boat race has returned once again to Florida's Space Coast. According to event organizers, this year's race will feature more world class race teams than ever before. From 3:30 p.m. to 4:30 p.m., the Super Boat Parade will head south along State Road A1A from Port Canaveral to downtown Cocoa Beach. A block party and VIP race party will be take place later that night in downtown Cocoa Beach. The Race Village on Dave Nesbit Drive in the Cove at Port Canaveral will open from noon until 10 p.m. on May 14, 2016. The event will feature the powerboats on display along with food, drink, live music, and the 2016 Miss Thunder on Cocoa Beach Bikini Contest . On May 15, 2016, the first super boat race start time is at noon, followed by a second race that begins at 2 p.m. The race route runs from Jetty Park to Lori Wilson Park. The race will also pass The Cocoa Beach Pier, Fischer Park, and Shepard Park.